The City of Detroit has had more than its share of big, bad headlines in the last few years, but the bigger news is that not only is the greater downtown area rising like a phoenix but that its renewal is, in large part, being fueled by the old. Iconic skyscrapers, along with bread-and-butter office and factory buildings, are being transformed into apartments, hotels, chic shops and entertainment venues that are bringing in a new generation of employers and reverse-commuting residents to the once downtrodden city. These projects form the backdrop for a wider revival that includes a streetcar line, a bridge across the Detroit River to Windsor, Ontario, and a 44-block arena and entertainment district. 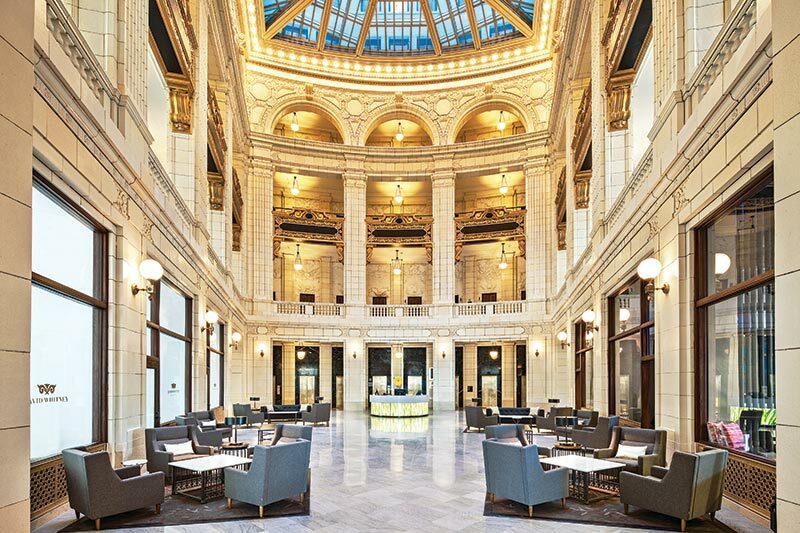 “This is the dawn of Detroit’s next golden age,” declares developer David Di Rita, principal of The Roxbury Group, which was founded in 2005 and has been working in the city since then. The so-called Renaissance City is in the perfect place and perfect time for a revamping. The story, appropriately enough, starts and ends with architecture. Founded in 1701 by the French trader Antoine de la Mothe Cadillac, Detroit came into its prime as a mercantile center in the 19th century, and the Gilded Age structures it erected reflected its power and prowess. The oldest, 1895s United Way Community Services Building, soon was joined by an illustrious set that included Detroit Cornice and Slate (1897), the Romanesque Globe Tobacco Building (1888) and the Wright-Kay (1891). The automobile-fueled building boom all but put them in the dust, adding a constellation of Art Deco and Neoclassical spectacular structures by the likes of Daniel Burnham, Albert Kahn, Louis Kamper and Smith Hinchman & Grylls that still define its mighty Midwest skyline. Burnham’s Ford (1909), Dime Building (now Chrysler House) (1912) and David Whitney (1915) led the way for Kamper’s Book Cadillac Hotel (1924) and Book Tower (1926); Albert Kahn Associates’ Cadillac Place (1923) and Fisher Building (1928); Writ C. Rowland’s Gothic Revival Buhl Building (1925), Penobscot (1928) and Guardian (1929); and John M. Donaldson’s David Stott Building (1929). During the succeeding decades, other buildings by other architects rose, but, for the most part, they were eclipsed by these historic gems. The city’s fortunes continued to rise and fall with those of the rest of the nation, and by the turn of the 21st century, the Motor City had sputtered to a halt. Unlike some other cities that scalped their skylines to modernize, Detroit pretty much left things alone simply because few were willing to invest in what was perceived as its bleak future.